It’s the biggest demographic tidal wave ever to sweep the US. And today I’m going to give you 3 quick ways to profit from it. I’m talking about the retirement of the baby boomers—10,000 of whom are clocking out of the workforce every day. And if you’ve been reading my columns, you know I’ve been banging the drum on the most obvious way to cash in: by investing in real estate investment trusts (REITs) that own senior-care facilities. Today I want to show you 3 other investments that are turning the surge in America’s senior population into soaring dividends and double-digit annual gains. All 3 of these investments, which I’ll detail a little further on, are also REITs, but with one key difference from my other “retiring boomer plays”: they own apartment buildings. You’ve probably heard that millennials are passing on home ownership in droves. Instead, they’re lining up for tony apartments in hip neighborhoods like Silver Lake in Los Angeles or Brooklyn’s Sunset Park. But what’s getting a lot less play is the fact that a big chunk of the 75-million-strong boomer generation is going after the exact same thing. And because these folks want to be close to the kids, as well as trendy restaurants and other big-city amenities, they’re apartment hunting in the exact same places. The truth is, the boomers—not the millennials—are driving rental demand these days. According to rental-market website Rent Café, the number of renters aged 55 and up surged 28% from 2009 to 2015, well ahead of the 3% growth in 34-and-unders. Meantime, 2016 numbers from Freddie Mac tell us that 5 million more boomers will rent their abode by 2020. That’s nearly 7% of the entire boomer population! And you can bet this trend is still in the early innings. So let’s start tapping it for gains and serious income now. To do it, we’re going to zero in on 3 residential REITs with buildings right where these downsizing boomers want to be. All 3 also throw off dividends at least 55% higher than the piddling 1.8% you’d get from the average S&P 500 stock. Oh, and they also boast sparkling payout growth too. So here, in order of quality—worst to first—are the 3 residential REITs that should be on your list now. UDR Corp. (UDR) isn’t a name you hear often, but it’s been around for 45 years and has paid dividends every year since 1985. The REIT owns or has stakes in 50,127 apartments. Its strategy is simple: build or buy in popular neighborhoods where companies are starved for workers and housing is tight: think San Francisco, Boston and LA. One thing I love about UDR is that management knows its strengths. A year ago, the REIT unloaded a mall in Washington State for $31.5 million, slashing its already microscopic exposure to retail, a sector that’s getting run over by Amazon.com (AMZN). So what’s the main reason to invest in UDR now? As with any REIT worth its salt, it’s the dividend—but don’t get distracted by the current dividend yield, which is a modest (for a REIT) 3.2%. 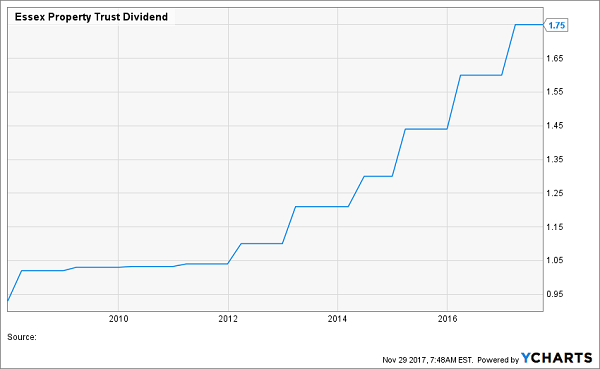 The real story here is dividend growth, with the payout popping 41% in the last five years. 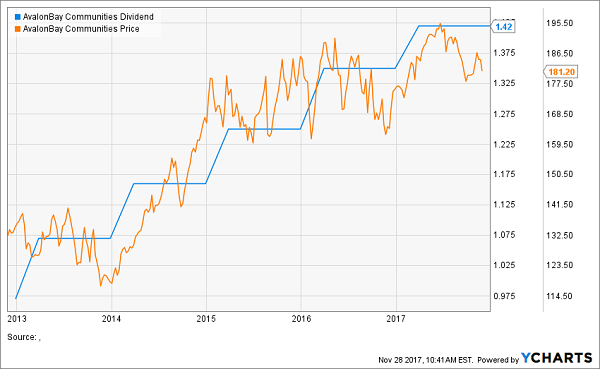 Put another way, thanks to that rising dividend, if you’d bought UDR five years ago, you’d be yielding a cool 5.4% on your original investment today. And you won’t lose sleep over this payout, either: over the past four quarters, it’s eaten up a reasonable (for a REIT) 73% of adjusted funds from operations (FFO, a better measure of REIT performance than earnings per share). But even with these advantages, UDR is a level below my next two picks, which we’ll move on to now. The AvalonBay Communities (AVB) portfolio reads like a cheat sheet of America’s hottest rental markets; the REIT is a mainstay in Boston, New York and thriving Bay Area cities like San Francisco and San Jose. But it also has a nice balance, with between 13,000 and 18,000 units in each of its five major markets. The stock yields 3.1% today, similar to UDR, but its payout is growing faster, up 46% in the last five years. The dividend is also safer, accounting for just 66% of core FFO. Toss in forecast 2018 FFO growth of up to 5.5% (based on management’s latest estimate), and you’ve got loads of room for a big payout boost when AVB makes its next dividend announcement in February. Heck, even Wall Street’s taking notice. UBS just slapped a buy rating on AVB and bumped its price target to $190 to $206. That implies up to 12.7% price upside—or 15.8% including the dividend! AVB would be my favorite of our 3 REIT picks today, if it weren’t for one other REIT that offers just a little bit more. Essex Property Trust (ESS) is sitting on 59,240 units in prime West Coast markets like San Francisco, LA, San Diego and Seattle. Sure, Essex is more concentrated in one area than AvalonBay, which sounds like a bad thing until you see that renters are falling all over themselves to grab an apartment in the Golden State. That’s showing up in Essex’s results: in the third quarter, the trust’s occupancy rate ticked up to a sky-high 96.7% from 96.5% a year ago. But it’s Essex’s long-run performance that really sets it apart: FFO has risen at an 8.5% compound annual rate since the trust’s IPO in 1994. That’s driven 23 straight years of dividend growth—including straight through the Great Recession! That’s right, the REIT grew its dividend through a financial crisis caused by real estate! That’s something neither of our other two picks can say and is a testament to management, the members of which have been with Essex for an average of 18 years. And don’t be fooled by Essex’s lower yield, at 2.8%, because the REIT is growing its dividend faster a lot faster than our other two picks: up 56% in the past five years. And thanks to its lower payout ratio (just 58% of FFO) and fast FFO growth (up 7.6% year over year in Q3), you can bet that will continue. In fact, Essex’s last dividend hike, announced in February 2017, was a whopping 9.6%! That makes now the time to buy—before management gives shareholders another big raise this February. The truth is, most folks overlook these 3 REITs for one reason: why buy a 3% payer when there are other stocks throwing off 6%, 8% and even 11% dividend yields? Trouble is, focusing too much on a high current yield—and ignoring dividend growth—is a pitfall that can leave your retirement in ruins. And when I say “in ruins,” I’m not exaggerating. 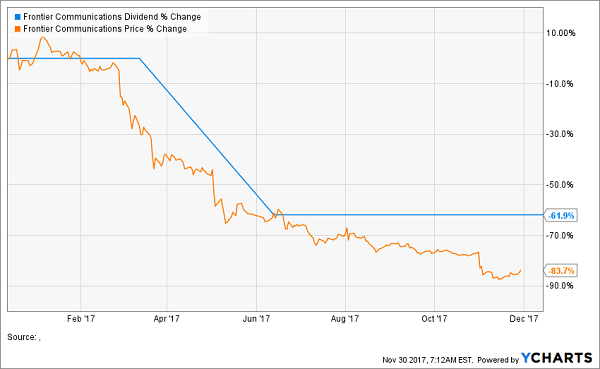 Check out what happened to folks who “took the bait” on Frontier Communications (FTR) a year ago, when it was throwing off a juicy 11.5% yield. Imagine having this disaster in your retirement portfolio—and watching helplessly as your original investment went almost to zero while your income got chopped by nearly two-thirds! It’s a classic yield trap, and one I’ve even seen savvy investors fall into. The saddest part is, this unhappy fate is totally avoidable. Because with payout growth like you’d get from the 3 REITs above, you can easily double up—and even triple up—the yield on your original buy in short order. And you can do it the safe and sure way, through companies with conservative payout ratios, rising cash flow and easily manageable debt. But AvalonBay, UDR and Essex are just the start, because I’ve found 7 other ultra-conservative stocks that are growing their already generous payouts even faster. In fact, I’ve handpicked each of these “super 7” to hand you 12% in safe, annual returns for life. This 7-stock “mini-portfolio” is retirement catnip because it provides the best aspects of numerous types of investment strategies—income, growth and even nest-egg protection! 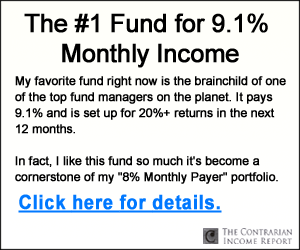 Let me show you the way to double-digit returns you can actually depend on. 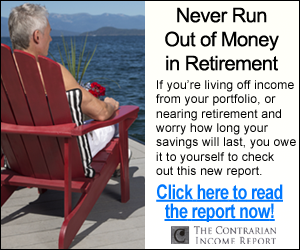 Click here and I’ll GIVE you 3 Special Reports that show you how to earn 12% for life. You’ll also receive the names, tickers, buy prices and my complete analysis of these 7 stout dividend growers absolutely FREE!